Biography*: Margaret of England (29 September 1240 – 26 February 1275) was Queen of Scots as the wife of King Alexander III. Margaret was the second child of King Henry III of England and his wife, Eleanor of Provence, and was born at Windsor Castle. Margaret’s first appearance in historical record comes when she was three years old. Margaret (28 February 1261 – 9 April 1283), who married King Eric II of Norway. Alexander (21 January 1264 Jedburgh – 28 January 1284 Lindores Abbey). David (20 March 1272 – June 1281 Stirling Castle); buried in Dunfermline Abbey. Margaret is said to have been unhappy in Scotland, and created some tensions between England and Scotland by writing to her family in England that she was poorly treated in Scotland. It was said that Margaret was responsible for the death of a young courtier, who reputedly had killed her uncle Simon de Montfort, 6th Earl of Leicester. While walking along the River Tay, she became annoyed with the young man. She jokingly pushed him into the river, but he was swept to his death by a powerful current before anyone could help. Biography*: The Lordship and Barony of Hailes is a Scottish feudal lordship (a feudal barony of higher degree). Hailes is traditionally believed to have been founded by an Englishman, taken prisoner in the reign of David II of Scotland, who was rewarded with the grant of lands in East Lothian for having on rescued the Earl of Dunbar and March from an attacking horse. Patrick de Dunbar, 9th Earl of March granted the Barony of Hailes to Adam de Hepburn (or Hibburne or Hyburne) in 1343 (thus the Hepburns held Hailes in heritage from the Earl of March, who in turn held it on behalf of the Crown); Hew Gourlay of Beinstoun having earlier foreited the lands. On 20 December 1451, James II, King of Scots, granted Sir Patrick Hepburn, 1st Lord Hailes, and his heirs and assignees, the lands of the Lordship of Hailes, including Hailes Castle, and other lands, to be incorporated into the free barony of Hailes. Sir Patrick Hepburn was created a peer of the Parliament of Scotland under the title Lord Hailes in 1453. The Lordship and Barony of Hailes remained in the Hepburn family until 20 December 1567 when it was forfeited to the Parliament of Scotland by James Hepburn, 4th Earl of Bothwell. On 1 October 1594, it was granted to Sir Walter Scott, 1st Lord Scott of Buccleuch, remaining with the Scott family until around the time of the Cromwellian invasion of Scotland in 1650 when it came into the possession of the Earls of Winton. In 1692, the Lordship and Barony of Hailes was disponed by James Melville of Halhill to Sir David Dalrymple, advocate and remained in the Dalrymple family until 1876 when it was transferred to Arthur James Balfour, 1st Earl of Balfour. Birth*: Elizabeth Clara McNeil was born circa 1868 in Nova Scotia, Canada. Marriage*: She married Alexander Cameron, son of Angus Cameron and Christina Beaton, in February 1920 in Halifax, Halifax, Nova Scotia, Canada. Death*: Elizabeth Clara McNeil died in 1956 in Springhill, Cumberland, Nova Scotia, Canada. Biography*: Berenguer Ramon I the Crooked, also called the Hunchback (in Catalan, Berenguer Ramon I el Corbat; and in Spanish, Berenguer Ramón I el Corvado or el Curvo) (1005 – 26 May 1035) was the count of Barcelona, Girona, and Ausona from 1018 to his death. He was the son of Ramon Borrell, Count of Barcelona, Girona, and Ausona and his wife Ermesinde of Carcassonne. He accepted the suzerainty of Sancho the Great of Navarre. Berenguer Ramon as a historical figure is enigmatic, shrouded in incomprehensible contradictions and ambiguities. First, he was a man of peace, and peace ruled throughout his reign. He pacified his neighbours as well, bringing to heel the Count of Urgell, Ermengol II. He reestablished amicable relations with Hugh I, Count of Empúries, and maintained them with William I of Besalú and Wilfred II of Cerdanya. He was a son of the church who maintained relations with the papacy and went on a pilgrimage to Rome in 1032. On many occasions he travelled to Zaragoza and Navarre to discuss with Sancho III the Great, King of Navarre their mutual stance against the Counts of Toulouse. His confidantes and councillors were the Abbot Oliva, the judge Ponç Bofill, Gombau de Besora, and the Bishops Pedro of Girona and Deudado of Barcelona. In 1025, he decreed that the proprietors of entails (men holding land in fee tail) were free from taxation. On the other hand, the government of Berenguer Ramon I marks the beginning of the decline of the comital power in Catalonia. At the death of his father in 1018, Berenguer Ramon was a minor and his mother Ermesinde served as regent until 1023. But even when he attained his majority, his mother would not relinquish the powers of regency and reigned with him. According to some chroniclers, Berenguer's character left some things to be desired. He is described as weak and indecisive. Moreover, his policy of peace with the Moors was a bone of contention with the noblesse, who saw war with the Muslims as a way of obtaining glory, wealth, and possibly even salvation. This led some nobles to act independently of the count's wishes. Ermesinde, contra her son, was energetic and decisive, intent on imposing the authority of Barcelona on the baronage. But, as a woman, her capability to exercise control of the military was greatly impeded and organizing a raid or expedition to satisfy the wants of the aristocracy was virtually impossible. The obliteration of comital authority became evident shortly before his death in 1035, as Ermisende partitioned his patrimony amongst his sons. Ramon Berenguer received Girona and Barcelona as far as the river Llobregat; Sancho received the frontierland from the Llobregat to the Moorish lands, which constituted the new county of Penedès with its capital in Olèrdola; and William was given the County of Ausona. Berenguer Ramon died on 26 May 1035 and was buried in Santa Maria de Ripoll. [S746] Wikipedia, online http://Wikipedia.com, https://en.wikipedia.org/wiki/Berenguer_Ramon_I,_Count_of_Barcelona. [S746] Wikipedia, online http://Wikipedia.com, https://en.wikipedia.org/wiki/Ramon_Berenguer_I,_Count_of_Barcelona. Biography*: Ramon Berenguer III the Great was the count of Barcelona, Girona, and Ausona from 1086 (jointly with Berenguer Ramon II and solely from 1097), Besalú from 1111, Cerdanya from 1117, and count of Provence in the Holy Roman Empire, from 1112, all until his death in Barcelona in 1131. As Ramon Berenguer I, he was Count of Provence from 1112 in right of his wife. 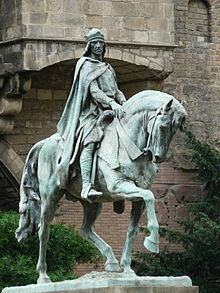 Born on 11 November 1082 in Rodez, Viscounty of Rodez, County of Toulouse, Francia, he was the son of Ramon Berenguer II. He succeeded his father to co-rule with his uncle Berenguer Ramon II. He became the sole ruler in 1097, when Berenguer Ramon II was forced into exile. During his rule Catalan interests were extended on both sides of the Pyrenees. By marriage or vassalage he incorporated into his realm almost all of the Catalan counties (except Urgell and Peralada). He inherited the counties of Besalú (1111) and Cerdanya (1117) and in between married Douce, heiress of Provence (1112). His dominions then stretched as far east as Nice. In alliance with the Count of Urgell, Ramon Berenguer conquered Barbastro and Balaguer. He also established relations with the Italian maritime republics of Pisa and Genoa, and in 1114 and 1115 attacked with Pisa the then-Muslim islands of Majorca and Ibiza. They became his tributaries and many Christian slaves there were recovered and set free. Ramon Berenguer also raided mainland Muslim dependencies with Pisa's help, such as Valencia, Lleida and Tortosa. In 1116, Ramon traveled to Rome to petition Pope Paschal II for a crusade to liberate Tarragona. By 1118 he had captured and rebuilt Tarragona, which became the metropolitan seat of the church in Catalonia (before that, Catalans had depended ecclesiastically on the archbishopric of Narbonne). Toward the end of his life Ramon Berenguer became a Templar. He gave his five Catalonian counties to his eldest son Ramon Berenguer IV and Provence to the younger son Berenguer Ramon. He died on 23 January/19 July 1131 and was buried in the Santa Maria de Ripoll monastery. [S746] Wikipedia, online http://Wikipedia.com, https://en.wikipedia.org/wiki/Ramon_Berenguer_III,_Count_of_Barcelona. Biography*: Ramon Berenguer IV c. 1113 – 6 August 1162, Anglicized Raymond Berengar IV), sometimes called the Saint, was the Count of Barcelona who brought about the union of his County of Barcelona with the Kingdom of Aragon to form the Crown of Aragon. In the middle years of his rule, Ramon Berenguer turned his attention to campaigns against the Moors. In October 1147, as part of the Second Crusade, he helped Castile to conquer Almería. He then invaded the lands of the Almoravid taifa kingdoms of Valencia and Murcia. In December 1148, he captured Tortosa after a five-month siege with the help of Southern French, Anglo-Norman and Genoese crusaders. (When Moors later tried to recapture Tortosa, the women put up such a spirited defense that Berenger created for them the Order of the Hatchet.) The next year, Fraga, Lleida and Mequinenza in the confluence of the Segre and Ebro rivers fell to his army. The reconquista of modern Catalonia was completed. [S746] Wikipedia, online http://Wikipedia.com, https://en.wikipedia.org/wiki/Ramon_Berenguer_IV,_Count_of_Barcelona. Biography*: Robert Guiscard (c.?1015 – 17 July 1085) was a Norman adventurer remembered for the conquest of southern Italy and Sicily. Robert was born into the Hauteville family in Normandy, went on to become Count of Apulia and Calabria (1057–1059), and then Duke of Apulia and Calabria and Duke of Sicily (1059–1085). From 999 to 1042 the Normans in Italy, coming first as pilgrims, were mainly mercenaries serving at various times the Byzantines and a number of Lombard nobles. The first of the independent Norman Lords was Rainulf Drengot who established himself in the fortress of Aversa becoming Count of Aversa and Duke of Gaeta. In 1038 there arrived William Iron-Arm and Drogo, the two eldest sons of Tancred of Hauteville, a petty noble of the Cotentin in Normandy. The two joined in the revolt of the Lombards against Byzantine control of Apulia. By 1040 the Byzantines had lost most of that province. In 1042 Melfi was chosen as the Norman capital, and in September of that year the Normans elected as their count William Iron-Arm, who was succeeded in turn by his brothers Drogo, Comes Normannorum totius Apuliæ e Calabriæ ("the Count of all Normans in Apulia and Calabria"), and Humphrey, who arrived about 1044. This Robert was Norman by birth, of obscure origins, with an overbearing character and a thoroughly villainous mind; he was a brave fighter, very cunning in his assaults on the wealth and power of great men; in achieving his aims absolutely inexorable, diverting criticism by incontrovertible argument. He was a man of immense stature, surpassing even the biggest men; he had a ruddy complexion, fair hair, broad shoulders, eyes that all but shot out sparks of fire. In a well-built man one looks for breadth here and slimness there; in him all was admirably well-proportioned and elegant... Homer remarked of Achilles that when he shouted his hearers had the impression of a multitude in uproar, but Robert’s bellow, so they say, put tens of thousands to flight. The reformist Papacy, at odds with the Holy Roman Emperor (the Investiture Controversy) and the Roman nobility itself, resolved to recognize the Normans and secure them as allies. Therefore, at the Council of Melfi, on 23 August 1059, Pope Nicholas II invested Guiscard as duke of Apulia, Calabria, and Sicily. Guiscard, now "by the Grace of God and St Peter duke of Apulia and Calabria and, if either aid me, future lord of Sicily", agreed to hold his titles and lands by annual rent of the Holy See and to maintain its cause. In the next twenty years he undertook a series of conquests, winning his Sicilian dukedom. Guiscard invaded Sicily with his brother Roger, capturing Messina in 1061 with comparable ease: Roger's men landed unsighted during the night and surprised the Saracen army in the morning, while Guiscard's troops landed unopposed and found Messina abandoned. Guiscard immediately fortified Messina and allied himself with Ibn at-Timnah, one of the rival emirs of Sicily, against Ibn al-Hawas, another emir. The armies of Guiscard, his brother, and his Moslem friend marched into central Sicily by way of Rometta, which had remained loyal to al-Timnah. They passed through Frazzanò and the pianura di Maniace, where George Maniakes and the first Hautevilles had distinguished themselves 21 years prior. Guiscard assaulted the town of Centuripe, but resistance was strong, and he moved on. Paternò fell, and Guiscard brought his army to Enna (then Castrogiovanni), a formidable fortress. The Saracens sallied forth and were defeated, but Enna itself did not fall. Guiscard turned back, leaving a fortress at San Marco d'Alunzio, named after his first stronghold in Calabria. He returned to Apulia with Sichelgaita for Christmas. He returned in 1064, but bypassed Enna making straight for Palermo. His campsite was infested with tarantulas, however, and had to be abandoned. The campaign was unsuccessful, though a later campaign, in 1072, saw Palermo fall, and for the rest of Sicily it was only then a matter of time. As a result of his Sicilian campaign, Guiscard was referred to as "Black Shirt Robert" because throughout the campaign he wore elegant clothing with imported dyes that ran together resulting in black clothing. Bari was reduced in April 1071, and Byzantine forces were finally ousted from southern Italy. The territory around Salerno was already held by Guiscard, and in December 1076 he took the city, expelling its Lombard prince Gisulf, whose sister Sichelgaita he had married. The Norman attacks on Benevento, a papal fief, alarmed and angered Pope Gregory VII. Pressured by the emperor, Henry IV, Gregory VII turned again to the Normans, and at Ceprano in June 1080, he reinvested Guiscard, securing him also in the southern Abruzzi, while reserving Salerno. In his last enterprise, Guiscard mounted an attack on the Byzantine Empire, taking up the cause of Raiktor, a monk pretending to be Michael VII, who had been deposed in 1078 and to whose son Guiscard's daughter had been betrothed. He sailed with 16,000 men, including 1,300 Norman knights, against the empire in May 1081. He defeated Emperor Alexius I Comnenus at the Battle of Dyrrhachium in October 1081, and by February 1082 he had occupied Corfu and Durazzo. He was recalled to the aid of Gregory VII, however, who was besieged in Castel Sant'Angelo by Henry IV, in June 1083. Also in 1083, Guiscard destroyed the town of Cannae, leaving only the cathedral and bishop's residence. Guiscard was ally to kingdom of Duklja and Constantine Bodin. In 1081 he married his daughter Iaqinta to Bodin in Bari. In May 1084, Guiscard marched north with 36,000 men, entered Rome, and forced Henry to retire. A rebellion, or seditious tumult, of the citizens led to a three-day sack of the city, after which Guiscard escorted the pope to Rome. Guiscard's son Bohemund, for a time master of Thessaly, had now lost the Byzantine conquests. Guiscard returned with 150 ships to restore them, and he occupied Corfu and Kefalonia with the help of Ragusa and the Dalmatian cities (which were under the rule of Demetrius Zvonimir of Croatia). On 17 July 1085, Guiscard died of fever at Atheras, north of Lixouri, along with 500 Norman knights. He was buried in the Hauteville family mausoleum of the Abbey of the Santissima Trinità at Venosa. The town of Fiscardo on Kefalonia is named after him. Guiscard was succeeded by Roger Borsa, his son by Sichelgaita, as Bohemund, his son by an earlier wife Alberada De Macon (aka Alberada of Buonalbergo), was set aside. Guiscard left two younger sons: Guy of Hauteville and Robert Scalio, neither of whom made any trouble for their elder brothers. At his death Guiscard was duke of Apulia and Calabria, prince of Salerno, and suzerain of Sicily. His successes had been due not only to his great qualities but to the "entente" with the Papal See. 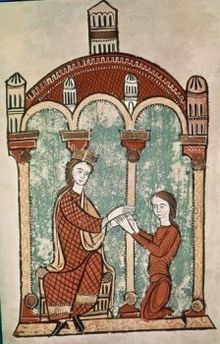 He created and enforced a strong ducal power, which was nevertheless met by many baronial revolts, including one in 1078, when he demanded from the Apulian vassals an "aid" on the betrothal of his daughter. In conquering such wide territories he had little time to organize them internally. In the history of the Norman kingdom of Italy, Guiscard remains essentially the hero and founder, though his career ended in "something of a dead end," while his nephew Roger II was the statesman and organizer. Although his relationship with the pope was rocky, Guiscard preferred to be on good terms with the papacy, and he made a gesture of abandoning his first wife in response to church law. While the popes were often fearful of his growing power, they preferred the strong and independent hand of a Catholic Norman to the rule of a Byzantine Greek. Guiscard received his investment with Sicily at the hands of Pope Nicholas II, who feared the opposition of the Holy Roman Emperor to the Papal reforms more. Guiscard supported the reforms, coming to the rescue of a besieged Pope Gregory VII, who had once excommunicated him for encroaching on the territory of the Papal States. After the Great Schism of 1054, the polarized religious atmosphere served to strengthen Guiscard's alliance with papal forces, resulting in a formidable papal-Norman opposition to the Eastern Empire. In the Divine Comedy, Dante sees Guiscard's spirit in the Heaven of Mars, along with other "warriors of the faith" who exemplify the cardinal virtue of fortitude. In the Inferno, Dante describes Guiscard's enemies as a field of mutilated shades stretching out to the horizon. Guiscard was the protagonist of Kleist's verse drama Robert Guiskard, incomplete at the author's death (1811). Matilda (also Mahalta, Maud, or Maude; 1059 – aft. 1085), married Ramon Berenguer II, Count of Barcelona. Mabile, married to William de Grantmesnil. Gersent, married to Hugh V of Maine, repudiated. Sibylla, married to Ebles de Ramerupt, 4th Count of Roucy and had 8 children. Biography*: Ramon Berenguer I (1023–1076), called the Old, was Count of Barcelona in 1035–1076. He promulgated the earliest versions of a written code of Catalan law, the Usages of Barcelona. Born in 1024, he succeeded his father, Berenguer Ramon I the Crooked in 1035. It was during his reign that the dominant position of Barcelona among the other Catalan counties became evident. Ramon Berenguer campaigned against the Moors, extending his dominions as far west as Barbastro and imposing heavy tributes (parias) on other Moorish cities. Historians claim that those tributes helped create the first wave of prosperity in Catalan history. During his reign Catalan maritime power started to be felt in the western Mediterranean. Ramon Berenguer the Old was also the first count of Catalonia to acquire lands (the counties of Carcassonne and Razés) and influence north of the Pyrenees. Another major achievement of his was beginning the codification of Catalan law in the written Usatges of Barcelona which was to become the first full compilation of feudal law in Western Europe. Legal codification was part of the count's efforts to forward and somehow control the process of feudalization which started during the reign of his weak father, Berenguer Ramon. Another major contributor was the Church acting through the institution of the Peace and Truce of God. This established a general truce among warring factions and lords in a given region for a given time. The earliest extant date for introducing the Truce of God in Western Europe is 1027 in Catalonia, during the reign of his father, Berenguer Ramon. While still married to his second wife Blanca, he became involved with the wife of the Count of Toulouse, Almodis de La Marche, countess of Limoges. Both quickly married and were consequently excommunicated by Pope Victor II. Ramon Berenguer I, together with his third wife Almodis, also founded the Romanesque cathedral of Barcelona, to replace the older basilica presumably destroyed by Al-Mansur. Their velvet and brass bound wooden coffins are still displayed in the Gothic cathedral which eventually replaced the cathedral that they founded. He was succeeded by his twin sons Ramon Berenguer II and Berenguer Ramon II. Biography*: Roger de Montgomery (fl. 1027), seigneur of Montgomery and vicomte of the Hiémois. Roger was the son of Hugh de Montgomery (955-1056) and Sibell De Crepon (1000-1046), both of Normandie, France. Roger was born 975 in Saint-Germain-de-Montgommery, Calvados, Normandy, France. He died on 7 Feb 1055 in Île-de-France, France. Roger's wife Josseline de Pont-Audemer was born in 975 in Pont-Audemer, Eure, Haute-Normandie, France. She died in Pont-Audemer on 7 Feb 1050. She was the niece of Gunnora, Duchess of Normandy. Roger held the lands of Saint-Germain-de-Montgommery and Sainte-Foy-de-Montgommery, both of which show traces of early castles. He acquired the office of vicomte of the Hiémois probably about the time Robert I became Duke in 1027. In c.?1031–1032 he witnessed a charter to the abbey of St. Wandrille by Robert I, Duke of Normandy as vicomte. Like Duke Robert, Roger began acquiring church properties, among these, c.?1025–27, half the town of Bernay. He took over a wood at 'Crispus Fagidus' which belonged to Jumièges Abbey in the 1030s. He suppressed a market held by the same abbey and transferred it into his own domain. He later returned the market to the abbey and paid restitution for their losses. In 1035 at Robert I's death, his great uncle, Robert Archbishop of Rouen ruled Normandy as regent. Roger seems to have lost favor with the young duke as well as his vicomte office as he signed an early charter of Duke William simply as Roger of Montgomery. At the archbishop’s death in 1037, anarchy broke out in Normandy and among the rebels was Roger de Montgomery, formerly one of Duke Robert's closest companions, who, after being defeated in his own territory, fled to the court of Henry I of France. Roger had been forced into exile by Osbern the Steward who was afterwards killed by William de Montgomery, Roger's son. Roger died on February 7th 1055 in exile in Paris, Ile-de-France, France. In 1068 his wife was still holding lands at Bures and Saint-Pair. [S746] Wikipedia, online http://Wikipedia.com, https://en.wikipedia.org/wiki/Roger_de_Montgomery,_seigneur_of_Montgomery. Biography*: Uchtred or Uhtred, called the Bold, (d. 1016) was the ealdorman of all Northumbria from 1006 to 1016, when he was assassinated. He was the son of Waltheof I, ealdorman of Bamburgh, whose ancient family had ruled from the castle of Bamburgh on the Northumbrian coast. In 995, according to Symeon of Durham, when the remains of St Cuthbert were transferred from Chester-le-Street to Durham, Uhtred helped the monks clear the site of the new cathedral. The new cathedral was founded by Bishop Aldhun, and Uhtred married Aldhun's daughter, Ecgfrida, probably at about this time. From his marriage he received several estates that had belonged to the church. In 1006 Malcolm II of Scotland invaded Northumbria and besieged the newly founded episcopal city of Durham. At that time the Danes were raiding southern England and King Ethelred was unable to send help to the Northumbrians. Ealdorman Waltheof was too old to fight and remained in his castle at Bamburgh. Ealdorman Ælfhelm of York also took no action. Uhtred, acting for his father, called together an army from Bernicia and Yorkshire and led it against the Scots. The result was a decisive victory for Uhtred. Local women washed the severed heads of the Scots, receiving a payment of a cow for each, and the heads were fixed on stakes to Durham's walls. Uhtred was rewarded by King Ethelred II with the ealdormanry of Bamburgh even though his father was still alive. In the mean time, Ethelred had Ealdorman Ælfhelm of York murdered, and he allowed Uhtred to succeed Ælfhelm as ealdorman of York, thus uniting northern and southern Northumbria under the house of Bamburgh. It seems likely that Ethelred did not trust the Scandinavian population of southern Northumbria and wanted an Anglo-Saxon in power there. After receiving these honours Uhtred dismissed his wife, Ecgfrida, and married Sige, daughter of Styr, son of Ulf. Styr was a rich citizen of York. It appears that Uhtred was trying to make political allies amongst the Danes in Deira. Through Sige, Uhtred had two children, Eadulf, later Eadulf III, and Gospatric. This Gospatric's grandson was the infamous Eadwulf Rus who murdered Bishop Walcher. In 1013 King Sweyn of Denmark invaded England, sailing up the Humber and Trent to the town of Gainsborough. Uhtred submitted to him there, as did all of the Danes in the north. In the winter of 1013 Ethelred was forced into exile in Normandy. After London had finally submitted to him, Sweyn was accepted as king by Christmas 1013. However he only reigned for five weeks, for he died at, or near, Gainsborough on 2 February 1014. At Sweyn’s death, Ethelred was able to return from exile and resume his reign. Uhtred, along with many others, transferred his allegiance back to Ethelred, on his return. Uhtred also married Ethelred’s daughter Ælfgifu about this time. In 1016 Uhtred campaigned with Ethelred's son Edmund Ironside in Cheshire and the surrounding shires. While Uhtred was away from his lands, Sweyn's son, Cnut, invaded Yorkshire. Cnut's forces were too strong for Uhtred to fight, and so Uhtred did homage to him as King of England. Uhtred was summoned to a meeting with Cnut, and on the way there, he and forty of his men were murdered by Thurbrand the Hold, with assistance from Uhtred's own servant, Wighill and with the connivance of Cnut. Uhtred was succeeded in Bernicia by his brother Eadwulf Cudel. Cnut made the Norwegian, Eric of Hlathir, ealdorman ("earl" in Scandinavian terms) in southern Northumbria. The killing of Uhtred by Thurbrand the Hold started a blood feud that lasted for many years. Uhtred's son Ealdred subsequently avenged his father by killing Thurbrand, but Ealdred in turn was killed by Thurbrand's son, Carl. Ealdred's vengeance had to wait until the 1070s, when Waltheof, Ealdred’s grandson had his soldiers kill most of Carl's sons and grandsons. This is an example of the notorious Northumbrian blood feuds that were common at this time. Uhtred's dynasty continued to reign in Bernicia through Ealdred, Earl of Bamburgh (killed 1038) his son from his marriage to Ecgfrida, and Eadulf (killed 1041) his son from his marriage to Sige, and briefly Eadulf's son Osulf held the earldom of northern Northumbria 1067 until he too was killed. Eadulf's brother Cospatric began the Swinton Family dynasty, his son Eadulf Rus famously murdering William Walcher, Bishop of Durham which led to William the Conqueror sending an army northwards to harry the region again. Uhtred’s marriage to Ælfgifu produced a daughter, Ealdgyth, who married Maldred, brother of Duncan I of Scotland and who gave birth to a son, Gospatric, who was Earl of Northumbria from 1068 to 1072. In Bernard Cornwell's series The Saxon Stories the protagonist is Earl Uhtred of Bebbanburg, also from Northumbria. The story of the siege of Durham and the severed heads on poles is told about the historical Uhtred (see Battles of the Dark Ages, Peter Marren), though it is perhaps possible to assume that the fictional Earl Uhtred of Bebbanburg is an ancestor of this Uhtred. In Bernard Cornwell's series he adds a 'historical note' at the end, in which, especially in the first book, he mentions that Uhtred was his ancestor. He took the liberty of installing Uhtred earlier in history. Biography*: Aldhun of Durham (died 1018 or 1019), also known as Ealdhun, was the last Bishop of Lindisfarne (based at Chester-le-Street) and the first Bishop of Durham. He was of "noble descent". Since the late 9th century the see of Lindisfarne was based at Chester-le-Street because of constant attacks from invading Danes. However, in 994 King Æthelred II of England had paid a Danegeld (protection money) to King Sweyn I of Denmark and King Olaf I of Norway in return for peace. The pay-off worked and there followed a period of freedom from Viking raids. This encouraged Aldhun to return the remains of Cuthbert of Lindisfarne to their original resting place at Lindisfarne, and to reinstate the diocese there. En route to their destination however Aldhun claimed to have received a vision from Cuthbert saying that the saint's remains should be laid to rest at Durham. The monks detoured then to Durham, and the title Bishop of Lindisfarne was transferred to Bishop of Durham. The removal of the see from Chester-le-Street to Durham took place in 995. Symeon of Durham is the main source for the moving of the see, and he states that Uhtred the Bold helped the monks clear the site of the new cathedral, which was consecrated in 998. Aldhun was a bishop for 24 years, which puts his death in 1018 or 1019. He was said to have died of heartbreak because of the defeat of the Northumbrians by the Scots at the battle of Carham. Biography*: Waltheof was high-reeve or ealdorman of Bamburgh (fl. 994). He was the son of Osulf I and father of Uhtred the Bold, Ealdorman of Northumbria. His name is Scandinavian and implies that he had Viking ancestors. The name 'Waltheof' remained in his family when Earl Siward married his great-granddaughter and named his son Waltheof. This son of Siward became Waltheof, Earl of Northumbria, and one of his descendant being Saint Waltheof of Melrose. Additionally, another branch of the family would use the Waltheof name including: Waltheof of Allerdale who was son of Gospatric, Earl of Northumbria. Waltheof of Inverkeithing and Dalmeny was son of Cospatric, and grandson of Waltheof of Allerdale. Another descendant of Gospatric, Earl of Northumbria was Waltheof, Earl of Dunbar. Genealogical research provides a thesis that there is a high probability that Waltheof de Strachan is likely descendant from this line as well. Walthoef de Strachan is the progenitor of Clan Strachan. Biography*: Osulf (fl. 946—54) was high-reeve of Bamburgh and ruler of Northumbria. Sometimes called "earl", he is more surely the first recorded high-reeve of Bamburgh and the man who, after assisting in the death of its last independent ruler Erik Bloodaxe, administered the York-based Kingdom of Northumbria when it was taken over by the Wessex-based King Eadred of England in 954. Osulf appears at least 5 times in witness lists for charters, some of which may be genuine, in the years 946, 949, and 950. In 946 and 949 he witnessed charters as "high reeve" In 949 he witnessed an Evesham grant as well as a grant by King Eadred to Canterbury Cathedral as dux. And in 950 an Osulf Bebbanburg is alleged to have witnessed as Earl. He is the first man specifically designated "high-reeve" of Bamburgh. High-reeve is Old English heah-gerefa, which Alfred Smyth thought was influenced by the Scottish word mormaer, which possibly has the same meaning ("High Steward"). Judging by the North People's Law, a high-reeve was not the same as an ealdorman (dux), having only half an ealdorman's wergild. Osulf's origins are unclear. A genealogy in the text De Northumbria post Britannos, recording the ancestry of Waltheof Earl of Northampton (and, briefly, Northumbria), suggests that Osulf was the son of Eadulf of Bamburgh, the ?King of the Northern English? who died in 913. Richard Fletcher and David Rollason thought he might be the Osulf Dux who had witnessed charters further south in the 930s, which if true would extend Osulf's floruit back to 934. Though Eadulf and Ealdred appear to have ruled Northumbria, in the years running up to 954 the kingdom was controlled by the Scandinavians Amlaíb Cuarán and Eric Bloodaxe. According to Roger of Wendover's Flores historiarum (early 13th century), Osulf was responsible for a conspiracy with a certain Maccus that led to the betrayal and death of Eric Bloodaxe, King of Northumbria, "in a certain lonely place called Stainmore". In this year the Northumbrians drove out Eric and Eadred succeeded to the kingdom". Primus comitum post Eiricum, quem ultimum regem habuerunt Northymbrenses, Osulf provincias omnes Northanhymbrorum sub Edrido rege procuravit. First of the earls after Erik, the last king whom the Northumbrians had, Osulf administered under King Eadred all the provinces of the Northumbrians. Similar sentiments were expressed in the related Historia Regum: "Here the kings of Northumbrians came to an end and henceforth the provinces was administered by earls". Eadred's takeover and Osulf's rule thus represent the beginning of permanent West Saxon control of the North. Historian Alex Woolf argued that this take-over was a personal union of crowns rather like that between Scotland and England in 1603. Little else is known about Osulf's period in power. The Chronicle of the Kings of Alba says that in the time of Ildulb mac Causantín (954—62), Edinburgh was abandoned to the Scots, though nothing is said about the involvement of Northumbrians or Osulf.